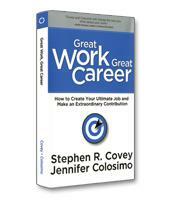 When is the right time to move from work that is comfortable to a career you have only dared to dream of? 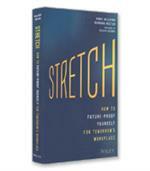 Mike Lewis offers his own story and stories of others who have “jumped,” which inspire, instruct and reassure. Additionally, he offers a four-phase Jump Curve. Ultimately, When to Jump offers clear guidance on how to jump and when. 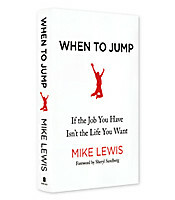 “What would you do if you weren’t afraid?” Mike Lewis’ When to Jump: If the Job You Have Isn’t the Life You Want introduces us to more than 40 people who dared to answer that question and left comfortable careers to start their personal dream projects. For Mike, that “jump” took place when he was 24, after he decided to leave his “ideal” corporate job with Bain Capital, a leading venture-capital firm, and pursue his dream of becoming a professional squash player. Phase 1: Listen to the Little Voice. Don’t ignore it as the symptom of a bad day at work, a missed promotion or a lost sale. Start to consider actually doing something about the idea you’d like to jump for. Jeff Arch put his dream of being a screenwriter aside and managed a karate school. After listening to his little voice, he returned to screenwriting and wrote Sleepless in Seattle, which was nominated for an Oscar in 1994. Phase 2: Make a Plan. Start planning, whether it’s on the back of a cocktail napkin or a fully-fledged business plan. Start “tackling the nitty gritty.” Alexandra Stein passed on her first opportunity to jump, regretted it immediately, and then planned for a year to grab the chance to leave her investment professional position and coxswain the 2012 US Paralympic Rowing Team. The heartening stories in When to Jump are reassuring, inspirational and instructive. 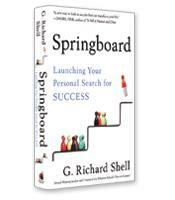 The author tempers the leap-of-faith aspect of “jumping” with the pragmatic guidance of the “Jump Curve.” It&rsuo;s not written to be “an instruction manual but as a steady hand of support,” featuring the stories of more than 40 veteran “jumpers” who would welcome you into their community.